Thanks for choosing Falken Tyres. We know you’ll be happy with them. With some products we also provide extra peace of mind guarantees. Register online via the form below. If you need to make a claim, contact your original place of purchase. Sumitomo Rubber Australia (SRAU) is the authorised distributor of Falken Tyres in Australia. 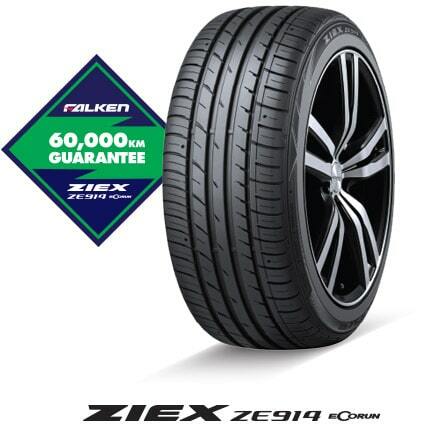 The Falken Ziex ZE914 60,000km Guarantee (Guarantee) is only available for certain tyres from certain participating Falken Tyres dealers, and is in addition to the SRAU Warranty conditions. These Terms & Conditions are subject to change without notice. Please refer to www.falken.com.au for the latest and full Terms & Conditions. A minimum of four (4) tyres are purchased from a participating Guarantee dealer. Registration is conducted online within 30 days of purchase. Original invoice is kept. The Service Schedule is maintained and documented. Falken brand Ziex ZE914 radial ply tyres are guaranteed to achieve 60,000km before becoming worn out at 1.6mm remaining tread depth. Pro rata adjustment credit will be given based on percentage of tread life not achieved. This tread life guarantee is applicable only for normal use & when all of the Owner Obligations are met. It does not apply to any Falken products not specified. Runflat tyres are excluded. Tyres will not be covered by this Guarantee if damage is caused by, but not limited to: acts of vandalism, theft, abuse and neglect; use in motorsport and non-tarmac roads; commercial uses, such as taxis, hire cars, etc. ; mechanical and wheel alignment issues, improper inflation pressures, incorrect usage, negligence, failure to maintain or rotate tyres. This Guarantee does not apply to vehicles with staggered tyre fitments. Tyres that are modified in any way from the original design. Any Guarantee claims must be presented to a Falken dealer participating in the Guarantee scheme. Tyre owners must have registered online, present their completed and up-to-date Service Schedule and original invoice to the original place of purchase to make a Guarantee claim. Claims are valid six (6) years from the date of retail sale. The Guarantee is not transferrable.